Anyone interested in WWII history will have heard of the 1945 Yalta (or Crimean) Conference. It was here at the Livadia Palace that the Churchill, Roosevelt and Stalin met to negotiate how post-war Europe was to be carved up. Livadia is a palace that’s filled with history. The huge, stunning White Hall on the ground floor is where the Big Three and their delegation met to agree that the USSR would have the biggest influence over Eastern Europe in exchange for keeping out of the Mediterranean. Imagine the charged-up atmosphere of the place during the Conference! In various rooms of the Palace there are lots of black and white pictures capturing the proceedings during the Yalta Conference, including the famous shot of Churchill, Roosevelt and Stalin taken in the courtyard. During the Conference, which ran over 8 days from February 4 – 11, 1945, the delegates of the allied States participating in the Conference stayed in three palaces in Southern Crimea. The U.S. delegation stayed at the Livadia Palace, the British delegation were accommodated at Aloupka Palace whilst the USSR delegation were housed at the Koreiz Palace. Livadia was originally built in 1911 as a summer palace for Tsar Nikolas II. Tuberculosis was the scourge during the time and Yalta’s sunny climate was recommended as being conducive for recuperation. There is a beautiful garden at the palace and a pathway that stretches some 7 km to the Swallow’s Nest. The family’s physician recommended that going for walks in the sunshine was beneficial for the Tsar’s family. Whilst the ground floor of Livadia is charged up with memories of war discussions, power broking and control of Europe, the rooms upstairs hold an air of sadness. 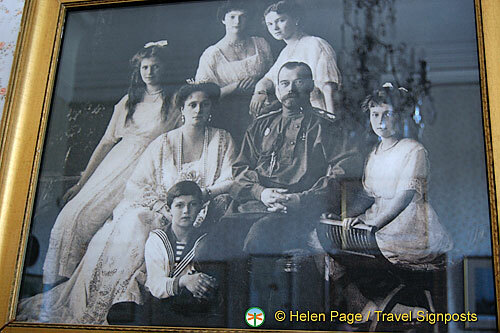 As you walk through the rooms with photos and portraits of the Tsar and his family, you can’t help but be moved by the tragedy that befell the Romanov family. A portrait of the Tsar taken before he abdicated hangs on one of the walls. His abdication did not appease the Bolsheviks who murdered the entire family in July 1918. At the back of the Palace is the Romanov Family Chapel. Nikolas II took an oath of faithfulness to the Russian throne here and his bride, Princess Alisa von Hessen was confirmed into the Orthodox Church and given the name Alexandra Feodorovna. During our visit, refurbishment was being carried out inside so scaffoldings, the curse of photographers, obstructed the nice view. In any case, photography is not allowed inside the Chapel, although I actually didn’t see the ‘no photography’ sign outside. If you so much as raise your camera hand, the nuns who run the place will quickly tap you on the shoulder. 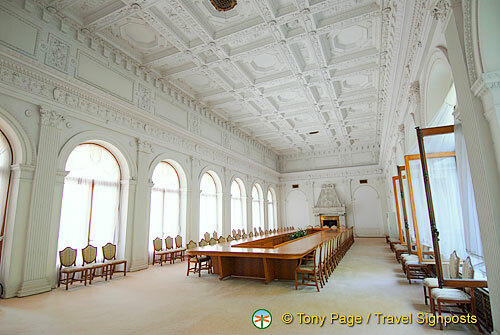 Livadia Palace is certainly worth a visit as the place is steeped with history. 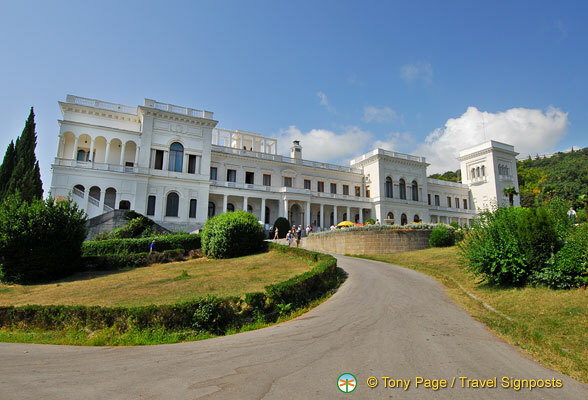 See Travel Signposts Livadia Palace Photo Gallery HERE. Can you tell me if the Livadia palace (Yalta) is open on Sundays and, if so, what time it opens and what time it closes? I would like to visit on Sunday May 22nd ? I had a good look around the net for current information for Livadia Palace’s opening times, but the information is not easy to find. We went on a cruise, and the excursion to Livadia was all organized for us. Note: From my experience in contacting other Ukrainian service providers online is that it can take days before anyone responds to you, if at all. The other alternative is to give them a call. Following are the phone numbers: Yalta (tel. : (+38 0654) 31-55-79, 31-00-98, 31-55-81, 31-55-62). Apologies for not being able to provide a more definitive response.